First, let me say that growing your Facebook Fan Page is a process, not an event. You more than likely WILL NOT go from 10 fans to 1500 fans overnight… I’m just saying! Ok, now let me tell you about a tool I use religiously to help grow my Facebook Fan Page. This tool will allow you to see quickly and easily what posts are clicking with your audience, and what ones aren’t. This tool is called Facebook Post Insights. 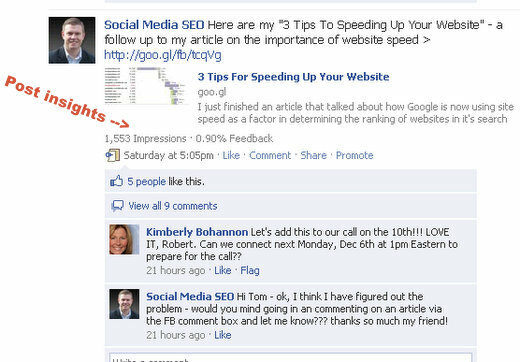 Facebook Post Insights are basically the traffic analytics to your Facebook Fan Page. But unlike Google Analytics that looks more at the link clicking pattern and referral sources of visitors, Facebook Fan Page insights is concerned with interactions. 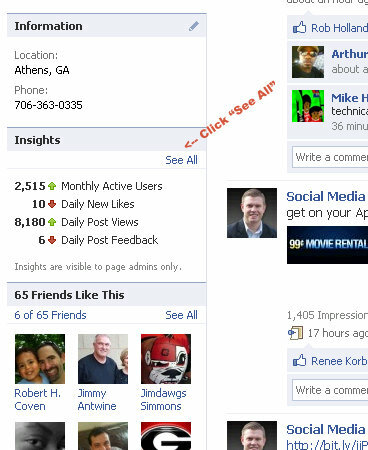 You see, interactions on Facebook are the ticket to increasing the overall exposure of your Facebook Fan Page. And the way Facebook sees it, the most effective element to measure the value of your Facebook Fan Page is to measure the interactions. Interaction data on your Facebook Fan Page includes actions such as “Likes”, sharing, commenting, recommending, etc… And this data includes interactions that occur within Facebook and other websites where Facebook is integrated – such as the Facebook Like button and Facebook Comment Box box on this blog. Accessing your Facebook Fan Page insights is a breeze, but of course, you have to first be logged into Facebook and also you need to be an admin of the page. The post insights appear underneath each of your Facebook Fan Page updates and give you a quick glance into the effectiveness of your updates. Just visit the wall of your Fan Page and look for the small, gray text underneath of your updates – you will see both the “Pageviews” and “Effectiveness” of each post. These post insights gives you a quick glance of all the updates on your wall (just scroll down through them all) and you can see which ones are performing better than others – based on the % Feedback indicator. Again, this % Feedback is based solely on the interaction of your Fan Page update. This is where you can really start to drill down on what your fans are interested in and what content generates the most interaction on your Facebook Fan Page. 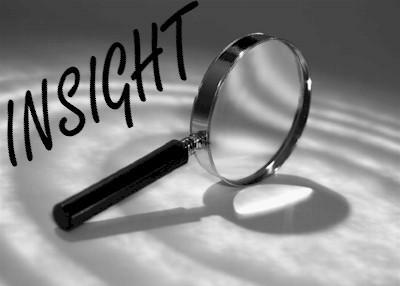 You get to the main Insights dashboard by simply clicking the “See All” link in the Insights section of your Facebook Fan Page. Once you click the “See All” link, you’ll then be taken to your main Insights dashboard. There’s a lot of cool info to browse through, but for the purposes of this article I want to focus on one area in particular – interactions. This is where the good stuff about your Fan Page comes to life. Go ahead and click on the “See Details” link in your Interactions. You will now be looking at the details of the interactions that occurred on your site. Scroll down to the “Most Recent Posts” section. This section gives you a deeper level of insight into the pageviews and interactions that have occurred within your Facebook Fan Page. More specifically, it gives you insights into your Fan Page updates. The variable I’m usually most interested in here is the Feedback column. Go ahead and click the Feedback column – this will sort your recent updates from the most interactions to the least. And now that your Fan Page posts are ranked from “most” to “least”, you can now see what posts got the most fan base interacting with your Fan Page. This information is invaluable because it tells you what type of updates are encouraging the most interactions from your fans – something Facebook believes is at the cornerstone to building an effective and authoritative Facebook Fan Page. Hi Robert! Thank you for this Insight (pond intended). I was going to write about this and while researching the topic I came across your article. I could not have done a better job, so I’ve told my readers about your article via my blog. Hope they come visit. Hi Josh – thanks for the feedback. Go ahead and leave a link to your blog.